1. (+) Ellie, the protagonist - Admittedly, I did not like Ellie in Angelfire--she seemed spoiled and completely unfit/unlike an angelic warrior... but I liked her more in Wings of the Wicked. She's matured. She's still a little bit ditsy (i.e. "Why couldn't evil wait for summer when I had nothing better to do than fight it and get a tan?" and "It was hard to imagine a boy that hot eating people, and eating people was just all kinds of wrong. "), but she's strong. Here's what one of the characters said about Ellie that I think captures who she is: "Most of the time you come off as a silly young girl to me, but when everything most important to you is at stake, you transform into this fearless thing of wonder, like a true avenging archangel." 3. (+) The Romance - Best part of the book, hands down. I was a little scared before reading because I thought that the whole book was going to be Ellie lusting after Will and him not relenting out of his sense of duty... There is some of that, but there's so, so, so much tension that each romantic scene was absolutely wonderful, and Will doesn't stay immovable the whole novel, and it's more than just his sense of duty. The best part was the fact that Will/Ellie were comfortable and intimate with each other in a way that didn't necessarily mean sexual. There was plenty of sexual tension (and thank God Ellie is a protagonist that is willing to embrace her sexuality, which seems a very rare thing in YA), but the scene I most remember from the novel isn't even one of the "hotter" scenes. It's not a happy scene-- Will presses his head against Ellie's stomach after a speech, and both characters are sad and regretting and it's so filled with emotion and intimacy, that one moment-- I loved it. Technically there is another romantic interest in the novel but he's no competition for Will/Ellie and he as a character is more used to advance plot than to anything else. 4. (+) Unpredictable - Part of the book's unpredictability I think came from the length and me forgetting the subtle foreshadowing that was done earlier but I don't think I would have ever seen that climax coming. Ms. Moulton has most definitely raised the stakes in this novel. 5. (+) Action-packed - When this book says there's a dark power and escalating danger, casualties will happen, and the book does not fail to jar you--that is to say, it's not all talk and no action. And thank God that when people are lost, the characters grieve! They don't move on as if the death doesn't matter, and even better, their grief doesn't become annoying/feel too lengthy. It feels realistic and adds a drastic edge to the action that actually makes it more important and not just action for the sake of action. 6. (+) Character Cast - One of the best parts of this book? The fact that the characters banter with each other and create some humor in the midst of all the drama about the war, Ellie/Will, and school... And we also get to meet some new characters who really set the stage for a dramatic showdown in the final book. 8. (+/-) The Writing - There were lots of cliches like "relief washed over me" and "ice filling her blood" etc. that pulled me out of the story when they came, but in general, the writing was easy to read. 9. (+/-) The Pacing - The book was broken into parts, and what I did enjoy was that though the book was long, though I put it down sometimes because of its length (especially since there's like 100 pages left after the major climax), it also was paced somewhat well. There usually wasn't a moment that was too dull, and if it seemed like the book was headed towards a lull, soon enough there'd be a romantic or action-filled scene to perk your interest again. 10. (+) The Cover - I like the swords, clouds, and boots/dress that show what Ellie is like... the only thing I wish was done differently is that font... and the moon because that reminds me of New Moon, and it's annoying to compare every paranormal romance to the Twilight saga. 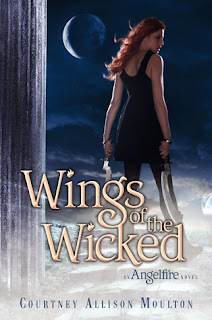 Wings of the Wicked enchanted me more than Angelfire, and I can't wait for the conclusion of this series. Ellie's growing strength, the compelling romance, and the escalating danger add a thrill that make me eager to see where these characters end up and how everything will come to a close. Reminded me of: if Paranormalcy and Unearthly were to have babies... Violent babies. Evie's voice is quirkier and less ditzy than Ellie's and Ellie's is more mature (as in, for the older YA crowd), but they're both strong. The mythology is as interesting as the angelology in Unearthly and there is a similar love triangle going on.